As part of our FAN residency at Plas Caerdeon, Wales 2016, each family prepared a short performance about families and climate change. This is the text from our performance. Write a list of all the performances we wanted to/could do with our kids about family change but we have run out of time, not got round to it, e.g. 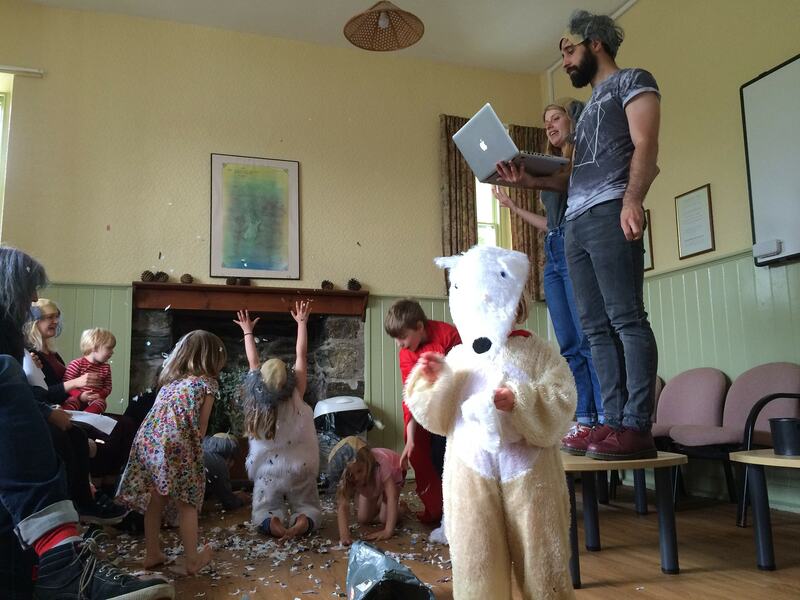 We wanted to make a performance where we were dressed as a family of polar bears. We wanted to make a performance where Ruby was the Sun and Ed was the storm and Jodie was the waves and I was playing the ukulele. We wanted to write a song about climate change. We wanted to collect all the junk mail that comes through our door and make it into a giant collage that when you look close up you can see the takeaway menus and estate agent leaflets but when you step back it looks like a forest fire. We wanted to plant a tree on a roundabout. We wanted to map out the route from Chichester to Paris in tape on the floor and do a real-time recreation of the journey using Edward’s toys – recorded as a time lapse video. We wanted to record Ruby reading The Lorax as an audio book. We wanted to record Ruby reading Naomi Klein’s This Changes Everything as an audio book. We wanted to record Ruby reading the Paris agreement as an audio book. We thought that ‘Children reading climate change related texts as audio books’ could be a spin off project that made us loads of money. We thought we could make clouds and perform a cloud-ballet. We thought we could learn how to frack and then frack something. We thought we could fill a range of fancy perfume bottles with crude oil and sell them as a luxury item. We thought we could record Ruby reading green pledges from election manifestos as audio books and send them to the our MP’s. We wanted to dress up as trees and choreograph a tree dance. We wanted to dress up as polar bears and choreograph a polar bear dance. We wanted to recreate those Issac Cordal sculptures with the kids in bald wigs and oversized grey suits. We wanted to collect all the plastic that comes with things we buy and cover the floor of the turbine hall in the Tate modern, so when you walk through you hear the crunching of plastic under foot. We wanted to make a performance where we shred a paper copy of the Kyoto protocol into a giant fan so it looks like a snowstorm.